With yesterday being exactly a week until Christmas, I indulged in a little bit of festive excitement in the form of The Great British Bake Off Christmas Special. It made for very pleasurable viewing indeed. Inspired by Paul and Mary's festive bakes, I found myself craving the likes of Stollen and Mincemeat Streusel (Mary's ingenious traybake alternative to thrashing out batches and batches of mince pies). But nothing raised my festive excitement levels more than the adorable gingerbread house lovingly crafted by the Mary and Paul dream-team, the latter of whom admitted that he had never made a gingerbread house before, although he has made a gingerbread cathedral... show-off. 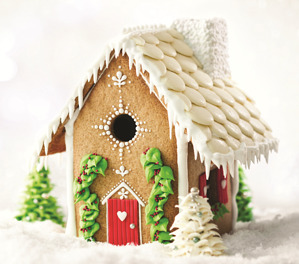 Every time I see a cute little gingerbread house I just want to get right on and make one of my own. Not even because I like gingerbread particularly much... no, it's mainly the prospect of decorating a mini house with sweets that draws me in. A mini-house covered in sweets! Just imagine! My fingertips are just itching to show off their penchant for neatness and decorating prowess. So without further ado, I bring you the first instalment in our mini-series of relatively simple recipes with a festive twist! 1. Preheat the oven to 190˚C/375˚F/Gas Mark 5. 2. 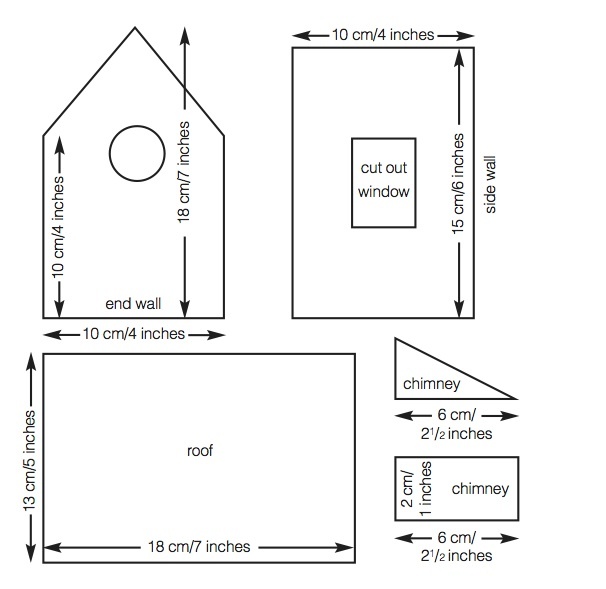 Draw templates for the shapes on card and cut out (see guide below) for the four sides, roof and chimney of the house. 3. Place the syrup, sugar and butter in a saucepan and heat gently until melted. Sift the flour, spices and bicarbonate of soda into a bowl. 4. Cool the melted mixture slightly, then pour into the bowl with the egg yolks. Knead the warm mixture to a soft dough and, while still warm, roll out between two sheets of nonstick baking parchment. Lift the top paper away and cut round the card template. 5. Lift away excess dough from the paper, slide the whole sheet of paper and dough onto a baking sheet and bake for 8–10 minutes. Leave to cool flat on the paper. 6. Repeat with the remaining dough and trimmings. When cool and stiff, assemble the house on a cake board. 7. Fill a large piping bag fitted with a no. 3 plain nozzle with royal icing and pipe along the wall edges. 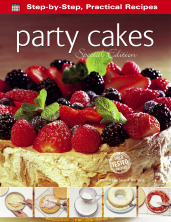 Join the walls together on a cake board and leave to set. Pipe along the top gable and wall edges and position the roof. Pipe around the chimney pieces, place these at the back of the roof and leave to set. 8. Pipe dots of royal icing onto the roof and fix on the chocolate buttons in an overlapping pattern. Colour the sugarpaste red and roll out thinly on a surface lightly dusted with icing sugar. Cut out a small door and four shutters, then mark lines on with a knife. Stick the door and shutters in place with royal icing. 9. Pipe hearts on the shutters and door and decorate the door with a silver dragee. Pipe lines and dots around the door and shutters, across the rooftop and chimney to decorate as shown in the picture. Pipe thick lines on the corner joins of the gables, then pipe onto the roof edges, letting the icing flick down to represent icicles. Spread white royal icing onto the cake board around the base of the house, flicking up to represent snow. Scatter over sparkly granulated sugar. 10. Place a little white icing in a paper icing bag fitted with a leaf nozzle. Starting at the base, pipe leaf shapes in a circle, pipe on another layer of smaller leaves, then continue building up the layers to make a fir tree. Colour the remaining icing green and pipe two green trees. Decorate the trees with silver dragees while still wet. Pipe leaf shapes either side of the door and scatter with red sprinkles while still wet. Check out this site 100% devoted to gingerbread artists. Just wow!